The Plaza Cavana is a family-run hotel with a very friendly atmosphere. Smell the blossom from nearby trees and that appetising aroma of fresh coffee. The pavement terrace of this central hotel is the ideal place to sit out and plan your day. Plaza Cavana is a lovely hotel. Staff are very friendly and speak good English, nothing was too much trouble. Our room was nicely furnished with very comfortable beds. Unfortunately our outlook was the internal light well. The roof top terrace was lovely. As has been said previously, the half board option is limited and as there are plenty of eating places around, B&B would be a better option. We had only one niggle and that was on Friday and Saturday nights the local Spanish youth have their evening out which goes on until the early hours and when you are trying to sleep it gets very annoying. Nerja is a very nice resort with lots of Spanish tourists so it can't be that bad. We stayed at the Hotel Plaza Cavana, booked through Portland Direct (part of Thomsons). The small hotel has 39 rooms and is perfectly located if you want to be in the centre of things and surrounded by the hustle and bustle of a busy town. It's located just a stone's throw from the Balcon. It looked as though the hotel had recently been refurbished - everything looked clean and new. Without exception the staff were very friendly and most of them spoke some English. Breakfast is from 8.30am until 10.30am. There's plenty to choose from - fruit, cheese, meat, a selection of bread (they have a toaster), cereal and you can pay extra if you want to order hot food. They have a computer with Internet access in the lobby area - 1 euro for 10 minutes. There's a vending machine next to it with a selection of reasonable priced snacks and drinks to purchase. There are two small pools - a lovely one one on the roof (great views over Nerja and the mountains) and another one indoors, where there is also a small gym that looked brand new. They have a sauna and jacuzzi but you have to pay 15 euro (for one) / 20 euro (for both) per couple to use these. - We had a room overlooking the square and it got very noisy at times, caused mainly by the scooters driving past/parking across the road. You'll need to close your balcony window to get any peace and quiet. If you want a quieter room, request one overlooking the little courtyard in the middle of the hotel. - The air conditioning is only switched on during the "summer season" and we found that it got quite stuffy in the room on some nights. - You have to pay for a safe deposit box in your room - 1.80 euro per day. Despite these, I wouldn't hesitate in staying at the Hotel Plaza Cavana again. We stayed at the Cavana for 1 week. We booked hotel, flights and car hire via the internet. 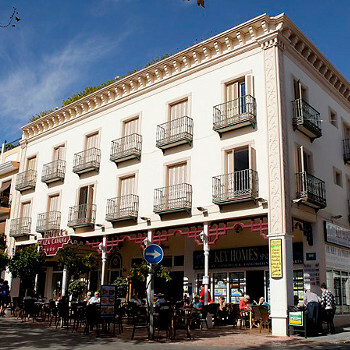 The hotel is in the perfect position for access to all of the main places in Nerja. The Cavana is very clean and all the staff are very pleasant and helpful. We stayed on a half board basis but on reflection if going again would go self catering. Breakfast consisted of the usual foreign fare and you could also for a small fee, have various cooked alternatives. The menu for dinner was a little disappointing. It consisted of the same six alternatives for starter, main and sweet all week. There is then a special starter, main and sweet which is changed every day. The food itself was excellent but not particularly our cup of tea. Our biggest disappointment was the car parking. If you hire a car as we did, you have no alternative but to park in the hotels own car park. I booked bed and breakfast only but ate in a few times and thoroughly enjoyed the food. Without exception the hotel staff were professional, friendly and helpful. The room was comfortable, well presented and clean with all the usual facilities. Located close to the Balcon and beaches and with open-air bars and coffee shop right outside the location couldn't have been better. Being so central noise was occasionally an issue at night - mainly from vendors dragging their stalls along the road outside (which was closed to traffic after about 9pm)in the early hours but I didn't notice that after a couple of nights and it only effects rooms on one side of the hotel. The only real pain was the hotel car park. Located under the hotel, access is by lift and getting a car in and out is hard work. I will definitely go back to the hotel.